so last week i was reading something off the relevant magazine website, and since it was about 2 in the morning i started thinking about elephants and then wondering why i was thinking about elephants and then realizing that it was probably because the word relevant sounds too much like the word elephant for 2 in the morning. so then i started thinking i was all clever and picturing relephant, the relevant elephant, and how funny that could be and then i was going to tweet it because that is what twitter is for and then i remembered my rule that i should keep my 2 am funny things to myself until at least 8 in the morning so that people will still respect me, because i usually wake up at 8 in the morning and think about the funny things of the night before and realize that they're actually more embarrassing than funny and i usually feel pretty good about my decision to keep them in my head. 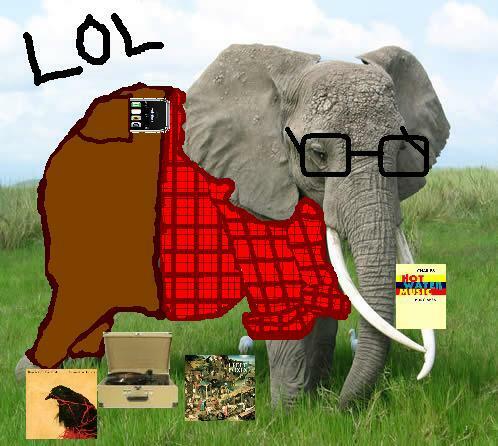 so i forgot about relephant the relevant elephant. DO YOU HAVE GOOSEBUMPS? I KNOW I DO. so then i told her that i had, i had thought of relephant, and i don't know if she believed me but she rejoiced with me that we're probably telepathic and stuff anyway, and then she sent me this this morning. from now on, any time paige baker has a good idea, you'll know that it's actually my good idea, telepathized to her at 2 am and then forgotten about by me. too bad for me, but paige is going to go places. congratulations, paige. also: i just saw this now. more goosebumps. telepathic telegram, spot on schedule.